A piece for Parshat Chukat in memory of Elie Wiesel. Great books capture something vital about what it is to be human. I feel a debt to an author when their work has given me a new way of thinking about life. The book, once absorbed, becomes a part of the way I look at the world, a new tool with which to decipher mysteries. Few books have had more of an impact on me than Elie Wiesel’s Night, the chronicle of the author’s time in Auschwitz. Beyond the book’s overall impact on me (which I once wrote about elsewhere) it gave me an insight into understanding a part of the book of Bamidbar and a crucial moment in the life of Mosheh Rabbeinu that had always perturbed me. Whenever I read this portion of the Torah I now remember Night. In my own internal world, it seemed both eerie and fitting that the Torah passage appears in parshat Chukat, – this week’s reading in the Diaspora and last week’s in Israel – in such close proximity to Wiesel’s passing. Given that he was as much Jewish educator as Holocaust witness, it seems appropriate to share this idea now. We are twenty chapters and forty years into the desert. The people are hungry and thirsty. They cry out. They would have preferred to have stayed in Egypt rather than die in this wilderness. Mosheh despairs and cries out to God, who responds that water will burst forth from the rock, enough for the whole congregation. And with this one act and response, Mosheh’s career as leader is given its end date. The goal to which he has been working for so many years will not be achieved. Like the generation who he led out of Egypt, and took to Sinai, he too shall die in the desert. The question most frequently asked about this passage is what exactly did Mosheh do wrong, for on a simple reading, the severity of the punishment is so much greater than that of the crime. Many are the answers given, but I would like to approach the story from another perspective, by posing a different question. What it is that we would expect to be Mosheh’s response at the sudden news that his life’s mission is to end in failure? He could argue with God – surely such a ‘small’ sin does not deserve such a harsh response? He could plead – at least him be given another chance! He could try to compromise – he would pass the mantle of leadership to another but let him at least live to see the promised land! Or, perhaps most likely, when all these efforts come to null, we would expect to see him break down – an emotional collapse as the great ambition towards which he has been working with all his might for the last forty years fades into the desert sands. Let us pass through your land. We shall not pass through fields or vineyards and shall not drink water from wells. Primo Levi, one of the few Holocaust writers who can claim to be Wiesel’s equal, writes in The Drowned And The Saved that one of the key factors that separated those who survived the Holocaust from those who perished was whether they had something else – a political ideology such as Communism or Zionism – or someone else – a relative or friend – that could expand their universe beyond the immediate misery and brutality of the camp, providing a reason to carry on living when everything else told them to give up. 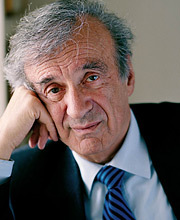 One of the critical characters in Night, is Elie Wiesel’s father. Together throughout their time in the camps each one looked out for the other, frequently giving away their own share of the rations when the other was on the verge of collapse. And throughout the work’s powerful description of their relationship one feels the truth of Levi’s insight – that both father and son carried each other through those years – not in the obvious sense that the stronger one provides for the weaker one, but that the stronger one is himself sustained by the knowledge that another human life is dependent on him. Thus one of the most poignant and painful moments in Night comes towards the end of the book as the war draws to a close. The Russians are approaching and the Nazis abandon the camp. All the prisoners who are fit to walk will be force marched hundreds of miles as the Germans withdraw, whilst those who are bedridden, including Wiesel’s father, will be left in the infirmary. Elie Wiesel is confronted with a terrible dilemma: does he take his father with him on brutal journey which he will surely not survive or does he leave him in the infirmary, not knowing whether or not the Nazis will blow up the camp as they retreat. He chooses the former option taking his father with him on the death march. As feared, his terribly ill father cannot make it and perishes on the way with no grave or burial. Wiesel loses his beloved father and the person who had given his life a modicum of meaning in the midst of the nightmare. And then something amazing happens. Wiesel remarks, almost as a footnote, that he later discovered that the Nazis had left the infirmary untouched, and that the inmates had been liberated by the Russians a few days later with many of them surviving. Had he left his father there, they may well have been reunited after the war! And yet this line never appears. Instead Wiesel moves on straight away with his story, moving to the next encounter in which he needed to navigate his survival. Over the years I have noticed this when Holocaust survivors tell their stories. So frequently did their families have opportunities to leave Europe before the war, or escape the Nazi clutches at some point or another. They didn’t take the escape route because they assumed that the madness would pass, because they couldn’t stand to lose everything they owned, or because they simply made a wrong calculation. And yet, almost without failure, at the moment when the listener expects them to break down into anguished ‘if onlys…’ they move straight on with their story, not pausing to reflect upon what might have been. Why do they do this? It seems to me that it must be a condition of those who survive. That in the face of the most devastating setbacks they do not pause to wallow in what-ifs. They pick up. They move on. Their world will never again be complete. But there is still a world there to save, a life to lead – and lead it and save it they must. Mosheh too must have dreamed of making it to the Promised Land. The decree that he would die in the desert must have been terrible. He could have given up at that point. Remonstrated. Screamed. Broken down. Upon the loss of their greatest hope or their dearest relative, neither Mosheh nor Elie Wiesel gave up. They did not berate themselves for the wrong decision they had made. They both carried on, knowing that there was still so much for them to do. In answer to the more frequently asked question, of what Mosheh did that was so heinous as to warrant such harsh punishment the midrashim provide many varied suggestions. One of the most intriguing is a tradition that Mosheh did not in fact sin at all, rather his fate was that of everyman. ומת בהר אשר אתה עולה שמה, אמר לפניו רבונו של עולם למה אני מת לא טוב שיאמרו טוב משה ממראה משיאמרו טוב משה משמועה לא טוב שיאמרו זה משה שהוציאנו ממצרים וקרע לנו את הים והוריד לנו את המן ועשה לנו נסים וגבורות משיאמרו כך וכך היה משה כך וכך עשה משה אמר לו כלך משה גזירה היא מלפני שהיא שוה בכל אדם שנאמר +במדבר יט יד+ זאת התורה אדם כי ימות באהל אמרו מלאכי השרת לפני הקדוש ברוך הוא רבונו של עולם למה מת אדם הראשון אמר להם שלא עשה פיקודיי אמרו לפניו והרי משה עשה פיקודיך אמר להם גזירה היא מלפני שוה בכל אדם שנאמר זאת התורה אדם כי ימות באהל. Said the angels before the Holy One. ‘Master of the Universe: why did Adam, the first man, die?’ God responded, ‘Because he did not fulfill My instructions’. Hashem responds to the angels’ question of why Mosheh died not by mentioning the sin of the striking of the rock (which is so clearly the reason mentioned in the Torah itself). Rather, unlike Adam who died on account of not listening to God, Mosheh died ‘because it is a decree that is equal before all men. Everyone must die. The midrash can be understood at various levels. At its simplest it is that literally all humans, even Mosheh, are mortal whose lives must eventually come to an end. The point may sound obvious but is worth pointing out when we remember that, contemporary to the midrash, certain religious ideas were coming into vogue that on occasion a great religious figures can gain immortality. Against this idea, the midrash argues that all men, even the very greatest, even Mosheh Rabbeinu, must eventually pass away. Moses does not enter the Land of Canaan not because his life is too short but because his life is a human life. For both Kafka and the midrash, this is something essential about what it means to be human: that no one finishes their life having achieved everything they would want to have achieved. I used to find this idea difficult and depressing. Is trying the first step to failure? But then I read Night and in light of Wiesel’s relationship with his father I understood something new about living in the wake of loss. It would have been completely understandable if Wiesel had broken down when his father perished and if he had spent the rest of his life berating himself for having taken his father out of the infirmary. Similarly, Mosheh could have ceased his work at the moment he was told that he would not lead the people into the land. But instead both of them carried on. Not looking backwards, regretting decisions they had taken. Instead they got on with the task at hand. They knew that they would no longer achieve everything, that their lives and worlds would not be complete. Yet even if they could not have everything there was still so much more for them to accomplish. Mosheh would lead the people to the edge of the land and would climb the mountain to see the place they would inherit. Wiesel would spend the rest of his life teaching the Jewish people and the world about the danger of the hatred of the other. And now the lesson of the midrash is no longer crushing. It is liberating. Once the message that one will never be completely successful is internalized, a person no longer needs to feel duty-bound to achieve everything. Rather, they are empowered to achieve exalted tasks along the way, knowing that they need not lament or berate themselves for that which they have fallen short on. It is not upon you to finish the work, but nor are you free to abstain from it. The most well-known answers given by the medieval commentators focus on the striking of the rock rather than speaking to it (Rashi) or on Mosheh’s anger (Rambam) as the central problem. I gave a shiur on the midrashic answers to the question here. Mosheh’s unwillingness to come to terms with the decree is in fact hinted to at the beginning of Parshat Va’etchanan, ‘And I pleaded with God at that time saying… let me cross over and I will see that good land’ (Devarim 3:23,25). According to Professor Gerald Blidstein, in his excellent book B’etzev Nevo, the topic of Mosheh’s death and his responses to it are more greatly elaborated upon than any other topic throughout midrashic literature. In Bamidbar however the text is silent.